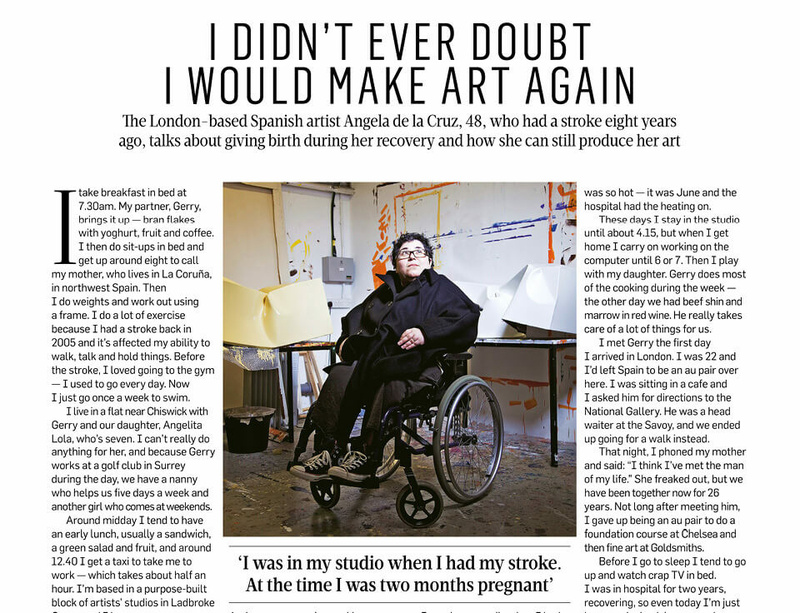 "I was in my studio when I had my stroke. At the time I was two months pregnant. I had this really bad headache so I took a cab to the nearest hospital, where I passed out. When I woke up, I had tubes everywhere. I’d been unconscious for three weeks... I almost died. One by one they took the tubes out, but I couldn’t breathe, so they gave me a tracheotomy. I was paralysed. Then when I went into labour, my daughter was born six weeks premature — they gave me a C-section. I felt so tired, and it was so hot — it was June and the hospital had the heating on. I was in hospital for two years, recovering, so even today I’m just happy to be back in my own home and my own bed. When I left hospital I didn’t make work for three years — I was just living one day at a time. But I didn’t ever doubt I would make art again one day. Artists can be away from their work for ages and still come back to it. And if I can do it, anyone can." Click here for the full Sunday Times article.